A number of people are seated at a table. Left to right, they are: A woman, a man, a woman, a man, and another man. Speaker: This young man is doing research for an essay on our amazing Skype security. Speaker: He'll talk with each of you. Explain to him how we handle user privacy. The speaker winks, as denoted by: *Wink*. The next panel shows a fragment of what might be a newspaper. At the top is a stylized logo in all lowercase: the guardian. 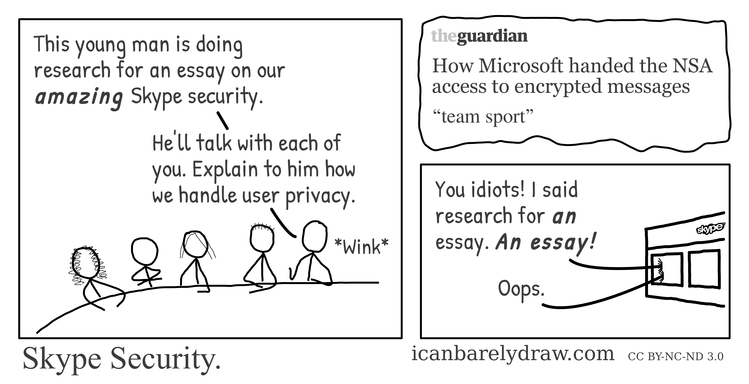 Below this is a headline: How Microsoft handed the NSA access to encrypted messages. Below this is a text fragment: “team sport”. The third and final panel shows the exterior of a building with large windows. On the building can be seen a stylized logo in lowercase: skype. Voice 1 from building: You idiots! I said research for an essay. An essay! Voice 2 from building: Oops.